109 Speech, or select reading E. S. Plimpton Select reading Miss Lena Wilson Music Miss J. Johnson Speech J. B. Dunbar Select reading Miss L. Brulingame The programme to be inter- spersed with music. Meeting adjourned Chas R. Meyer Sec. Denison IA. 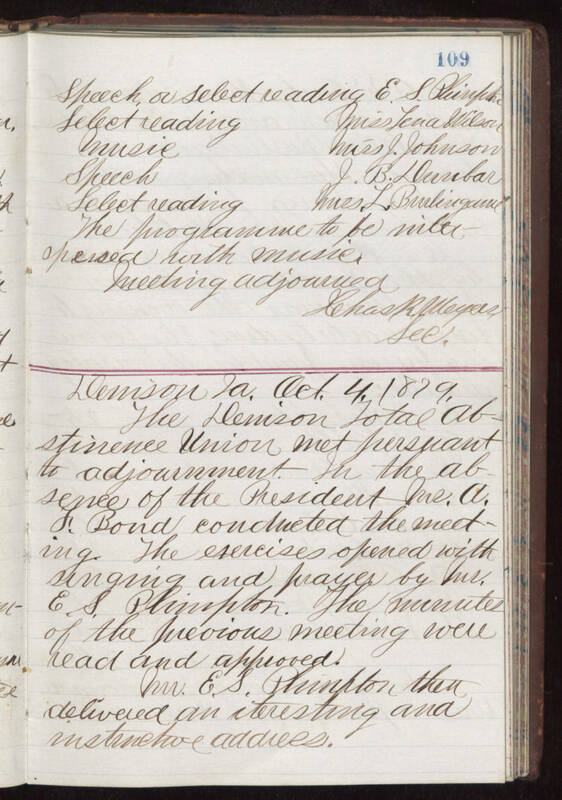 Oct. 4, 1879 The Denison Total Ab- stinence Union met persuant to adjournment. In the ab- sence of the President Mr. A. F. Bond conducted the meet- ing. The exercises opened with singing and prayer by Mr. E. S. Plimpton. The minutes of the previous meeting were read and approved. Mr. E. S. Plimpton then delivered an interesting and instructive address.